Saturn's icy moon Enceladus is seen half-lit, with the gas giant's glistening rings in the background, in this image from NASA's Cassini spacecraft released Dec. 27, 2017. The spacecraft took the image in 2011 and crashed into Saturn on Sept. 15, 2017. 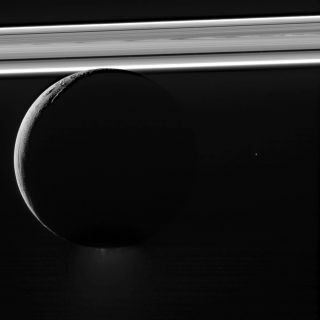 NASA's Cassini spacecraft has given the world a belated Christmas gift: a stunning view of Saturn's Enceladus moon silhouetted against the planet's glistening rings. Enceladus' frozen crust hides a "global ocean of liquid water," one that frequently bursts forth through fractures in the ice, according to NASA. This phenomenon can be spotted at the moon's south pole; the glow in fact comes from one of the "plume[s] of water-ice particles and other materials" that spew out with regularity. The bright point to the right of Enceladus is a distant star, NASA added in an image description. The Cassini-Huygens mission — a joint effort by NASA, the European Space Agency and the Italian Space Agency — began with the spacecraft's launch in October 1997. The mission ended on Sept. 15, when the probe plunged into Saturn's atmosphere and burned up about 45 seconds after its last transmission.